Pastor Russell’s Sermons from FUMC Pflugerville, 500 E. Pecan Street, Pflugerville, Texas 78660. Pastor Russell RECEIVING new Members. 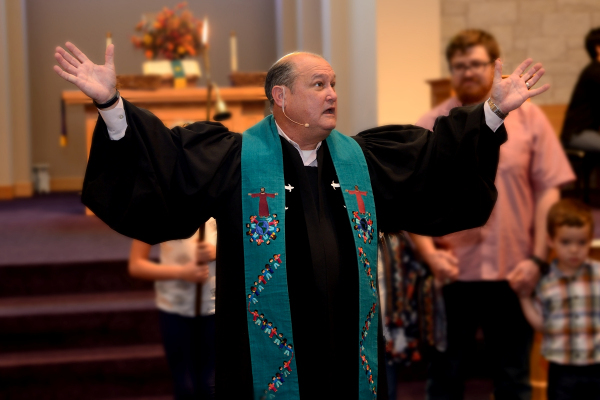 PfUMC offers both traditional and contemporary worship experiences. See more about our worship times at the OUR WORSHIP page. Each worship community receives the same sermon each Sunday. You can expect a powerful blend of Biblical teaching, modern illustrations, relevant application, along with a casual, friendly environment at both services. You are invited to enjoy a sampling of messages below and we hope that you will come visit very soon. The Real Meal Deal: Luke 22: 7,8 14-20 Excerpt: ”Jesus was a ritualist, going to temple regularly, freely participating in the Seders and festivals of Israel. He was not a prisoner to ritual. He was just following a religious life set out by his ancestors. It should not be a surprise at Jesus’ last Passover meal, he would initiate a new ritual of remembrance. He would use that meal to bring past and future together, helping us recall how Christ delivered us from our self-created captivity, so we may know the freedom of new life. His previous customs shaped this current ritual. Imagine Unity: John 17: 20-26 Excerpt: “The characters Jesus left behind included James and John, who argued about who’s the greatest. Matthew sold out to Rome for a good salary and Peter who promised to take out people like Matthew. Jesus knew they would never make impact unless supernaturally they were made one. He prays for their unity. We look at four aspects of this supernatural unity needed to walk together. September 23, 2018: Victoria Ayala, seminarian and candidate for ministry deliverers her sermon. Click here to watch it. September 16, 2018 The Hope of Letting Go: Philippians 3: 4-14 Excerpt: …in the language of our reading: It is in these activities we learn how to forget what lies behind and press on to what lies ahead. The more we can let go for the sake of others, the more hope we share with in the world. September 9 .2018 The Humility of Letting Go: Excerpt: The pattern for living the mind of Christ is the willingness to reach deep within to let go of anything, so we are better suited to help others live well. Christ showed this pattern that requires great humility in letting go for the sake of others. September 2, 2018 The Joy of Letting Go: Excerpt: There comes a day when we release our former ways to follow Christ into an uncertain tomorrow. Surprisingly, we find ourselves doing tasks for the sake of Christ we never assumed we could do. An unimagined future is realized, because we let go of what we thought was not possible.